It is the smallest species of cat, along with the black-footed cat of Africa. It is listed as Near Threatened(NT) on the IUCN Red List. The Indian Population is listed on CITES Appendix I.
HABITAT Moist and dry deciduous forests as well as scrub and grasslands. It is found in a wide range of habitats, with the exception of evergreen forest. RANGE Previously, it was believed to be confined to Peninsular India and Sri Lanka. Recent records, however, indicate that it is found throughout much of the subcontinent. 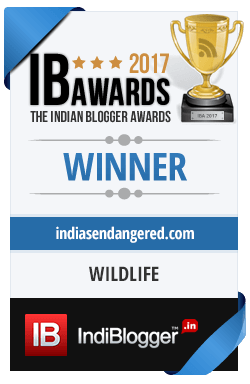 It has been camera trapped in Pilibhit and Corbett Tiger Reserves, in the Indian Terai, as well as in Bardia National Park in Nepal. In Sri Lanka, the cat has been recorded from montane and lowland rainforest. Is the world’s smallest wild cat, along with the African black-footed cat. 35-48 cm in length, with a long tail which is 15-30 m long. It weighs only 0.9-1.6 kg. It has short grey fur, with rusty spots over back and flanks, hence the name. The underbelly is white with dark spots, whereas the tail is almost spotless. There are 6 dark streaks on each side of the head. 2 subspecies are recognized-the Indian(Pr.rubiginosus) and Sri Lankan(P.r.phillipsi). Are primarily nocturnal, but also active during the day. Is an excellent climber, which allows it to catch birds. It also preys on rodents, lizards, frogs and insects. In spite of its small size, it is a territorial animal, and captive specimens have been known to use scent-marking. POPULATION Being a cryptic species, population estimations of the Rusty-Spotted Cat are difficult to carry out. Prior to 2016, the cat was listed as Vulnerable(VU) on the Red List, which suggested a total global population of less than 10,000 individuals. The current rating of “Near Threatened”(NT) does not suggest a population increase; the species occurs in very low densities throughout its range. Habitat loss due to cultivation is the biggest threat to the species. Even though it is a fairly adaptable species, the current rate of habitat loss can quickly imperil its existence. Though rare, poaching is also a threat. Man-animal conflict due to poultry depredation can also hurt the species’ population.